Give to everyone? Is Jesus Kidding? Are we really called to give to everyone? Luke 6:30 and Matthew 5:42 are two scriptures I would really like to remove from the Bible, if I am being honest. 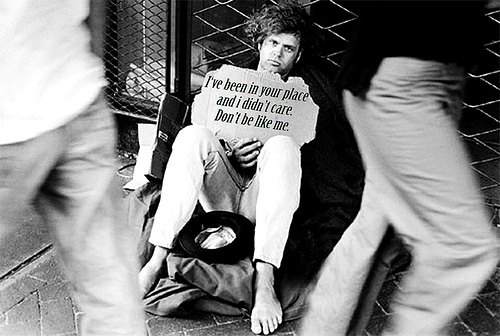 I live in a city and people are begging all the time, on every freeway off ramp, on every street corner. I have been approached multiple times in parking lots with stories of running out of gas and loss of debit card, and a dead cell phone. How am I to handle these things as a Christian? These scriptures make it fairly clear that I am to give to anyone who begs (some bibles say “asks”), but Paul says that anyone who doesn’t work doesn’t eat. So, it is not as straightforward as just giving to everyone, at least I don’t want it to be. I want to handle my money responsibly, but I also want to be obedient to Jesus and not be selfish with my money. How do we handle this dilemma. I will be upfront that I don’t know if I have a solid correct answer. This article is more about exploring the issue. If you are looking for a hard and fast answer: move along. Why do we not want to give to everyone? As with many things, asking why we feel a certain way can be very helpful. I don’t like the idea I’m being ripped off. I don’t want to be made a fool of. I don’t want to be parted with my hard earned cash under false pretenses. I give all the time when people I know are in need because I know them and their situation. They aren’t faking it. The gospel answers to these questions, of course, come from a proper understanding of stewardship; It isn’t my money in the first place, it is God’s. He has the right to require it of me anyway he likes, if I am to call myself a believer. Does it matter if the individual is sinning by lying to me. That is up to God to handle and he will either by forgiving them and making them his children or by allowing them to bear the punishment for their sins. So, am I simply worried about being a bad steward of God’s money? Maybe, but them I am reminded of a story I have heard about CS Lewis. If I am honest, even if I gave $20 to everyone beggar on every off ramp holding a sign that says “stranded” I would still give away less money than I waste on frivolous things. Is there a biblical reason not to give to everyone? Money is at best a temporary solution to the issue facing the person asking. Giving money to a person on the street is a great way for us to feel better about ourselves without actually doing any good for the person we give the money to in many cases. It seems to me that in the biblical context people knew more about one another. If you saw the same person begging in the same place every day for a year you could assume they were not able to work. You could ask if you didn’t already know their story. However, in our day that is very unlikely. Paul was pretty clear in saying that if a man doesn’t work he doesn’t eat. Laziness was not acceptable. But how do we know if that is the case if we don’t have a relationship with the people in need? As Christians we are called to give and help above and beyond. That is why Jesus called us to give to everyone who asks. He didn’t qualify it because he knew we would look for any excuse at all to not obey. What do you think? What are your considerations when it comes to giving to everyone that asks of you?